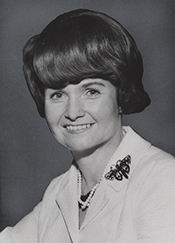 Margaret Mary Heckler served eight restless terms in the House, as she was frequently mentioned for state office while moving through six standing committees. “Her seniority and bargaining ability were weakened by these frequent moves,” observed a colleague, “and she was forced most often to carry her agenda directly to the House Floor.”1 Such activity may have been due to the fact that Heckler was a moderate Republican from one of the nation’s most liberal and Democratic states. Margaret Mary O’Shaughnessy was born on June 21, 1931, in Flushing, New York. She was the only child of John O’Shaughnessy, a hotel doorman, and Bridget McKeon O’Shaughnessy, Irish–Catholic immigrants. She graduated from Albertus Magnus College in 1953, marrying John Heckler, an investment banker, in 1954. Theirs would be a commuter marriage that eventually produced three children: Belinda, Alison, and John, Jr. The marriage ended in 1985 after she left Congress. Heckler went on to Boston College School of Law, where she was the only woman in her class. She graduated in 1956, forming a law office with fellow law school graduates. Shortly afterward she began volunteering in local Republican campaigns, and in 1958 she became a member of the Republican committee for Wellesley, Massachusetts, a position she held for eight years. Heckler's first elected office was to the eight-person governor's council (an elected advisory body mandated by the state constitution) in 1962, serving two terms. Thereafter, she was frequently mentioned as a possible candidate for statewide office. In the aftermath of Heckler’s defeat, President Ronald W. Reagan nominated her as Secretary of Health and Human Services. Nearly a week after the Senate confirmed her appointment, Justice Sandra Day O’Connor swore Heckler into the Cabinet on March 9, 1983. During her tenure she oversaw the establishment of new disability guidelines for Social Security and increased federal funding for Alzheimer’s disease. But her greatest challenge was dealing with the emerging HIV/AIDS crisis. Heckler came under attack from conservatives in late 1985 as an ineffective administrator and as weak in her support of the Reagan administration’s programs. She accepted President Reagan’s offer to be U.S. Ambassador to Ireland and served from December 1985 through October 1989. She currently resides in Wellesley, Massachusetts. 1Marcy Kaptur, Women in Congress: A Twentieth–Century Odyssey (Washington, D.C.: Congressional Quarterly Press, 1996): 133. 2Current Biography, 1983 (New York: H.W. Wilson and Company, 1983): 183. 3Hope Chamberlin, A Minority of Members: Women in the U.S. Congress (New York: Praeger, 1973): 318–319. 5Marie Smith, “She’s for a Strong Ethics Code,” 14 May 1967, Washington Post : K3. 6Lois Romano, “Heckler: Tough Campaigner for HHS,” 13 February 1983, Washington Post : L12. 7“Heckler,” 13 February 1983, Washington Post: L11. 12Lynn Olanoff, “Silvery Anniversary,” 18 April 2002, Roll Call: 42. 13Robert Pear, “Reagan Chooses Ex–Rep. Heckler To Be the New Secretary of Health,” 13 January 1983, New York Times: D22. 16“Frank Will Take On Margaret Heckler,” 14 January 1982, Roll Call. 17Juan Williams, “President Names Ex–Rep. Heckler as Head of HHS,” 13 January 1983, Washington Post: A8; Current Biography, 1983: 185. 18“Election Statistics, 1920 to Present,” http://clerk.house.gov/member_info/electionInfo/index.aspx. Papers: ca. 1966-1987, approximately 237 linear feet. The collection contains personal, business, and congressional papers and correspondence, including photographs, portraits, video tape, sound recordings, and memorabilia, documenting her career in Congress and in the Department of Health and Human Services. The collection also includes material relating to the Republican Party. Most of the collection is currently restricted. Film Reels and Videocassette: 1968; 1982, 4 commercials on 2 film reels and 5 commercials on 1 videocassette. The commercials were used during Heckler's campaigns for the 1968 U.S. congressional election in District 10 and the 1982 election in District 4, Massachusetts, Republican Party. "Margaret M. Heckler" in Women in Congress, 1917-2006. Prepared under the direction of the Committee on House Administration by the Office of History & Preservation, U.S. House of Representatives. Washington: Government Printing Office, 2006. Ralph Nader Congress Project. Citizens Look at Congress: Margaret M. Heckler, Republican Representative from Massachusetts. Washington, D. C.: Grossman Publishers, 1972.